Announcing our new Artistic Director! Please join us in welcoming Kevin Howard to the CCMMS family! The Cowan Community Action Group, Inc. (CCAG, Inc.) is looking for someone to fill the position of Program Coordinator for the Mountain Music School, an annual, week-long workshop in June that focuses on eastern Kentucky traditional musical heritage. The Program Coordinator is responsible for working with the Artistic Coordinator on all logistic details concerning the Mountain Music School, with support from Cowan Community Action Group, Inc. and volunteers. The position is contracted for $2,000 or as negotiated with CCAG, Inc. To apply, contact Randy Wilson at rwilson@hindmansettlement.org or (606) 594-9360. Applications are due by December 5, 2015. The Cowan Community Action Group, Inc. is pleased to announce the Charlie Whitaker Memorial Apprenticeship for 2015-2016 has been awarded to Kelsey Estep of Keaton, Kentucky. Her apprenticeship with Sarah Wood will focus on the mountain tradition of unaccompanied ballad singing. Kelsey is a senior at Johnson Central High School and the daughter of Beverly and Orville Paul Estep. 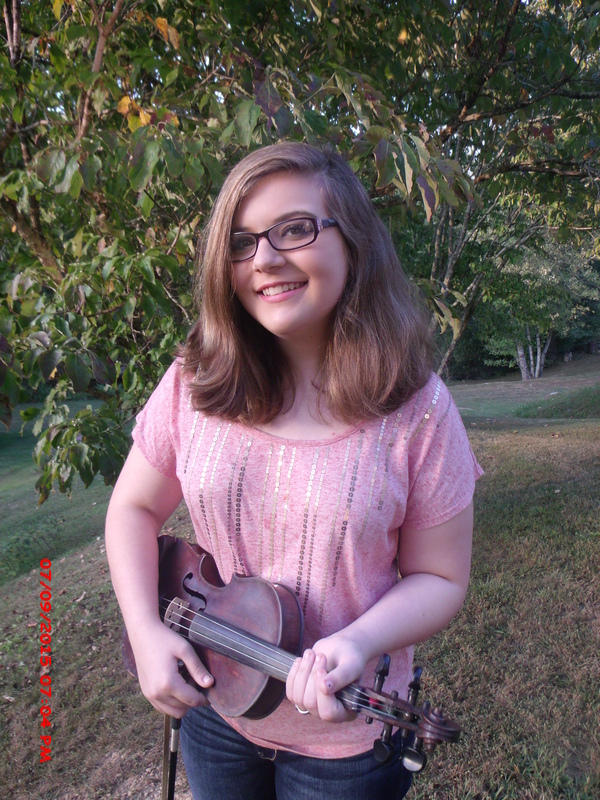 She began studying old time fiddle with Jamie Wells at age 8 and has been a student at the Cowan Creek Mountain Music School for the past 6 years. At CCMMS 2015 Kelsey served as a teaching assistant. The Charlie Whitaker Memorial Apprenticeship will support an intensive year of learning, performing and teaching. “I hope through this I can inspire other kids my age to explore the old time music culture” Estep says. Charlie Whitaker Memorial Apprentice Kelsey Estep will focus on unaccompanied ballad singing with her mentor, Sarah Wood. Announcing the First Charlie Whitaker Memorial Apprenticeship! Congratulations on a job well done to Meghan Bryant, CCMMS’s first Charlie Whitaker Memorial apprentice, and her mentor, Jesse Wells! Meghan is from Floyd County and is a sophomore in high school. She first learned fiddle from Jesse’s father, Jamie, and has been a “regular” at the music school each year along with her sister, who plays banjo. In 2015, Meghan also served as a teaching assistant for the first time. We appreciate her and Jesse generously passing on the music. I hope our former and future students of the Cowan Creek Mountain Music School are warm and safe wherever they are. Here on Cowan we are still snowed in. You can hardly believe that what the Center looks like now is what you see during your time here in June. This year the date of the music school is June 22-June 26. I wrote this letter earlier in the month, in fact the day after Ground Hog Day. I even kind of complained because we hadn’t had enough snow at that time to cover everything up and hide some of our unsightly sites that are so depressing in the winter. Please God forgive me for that, because we have now been covered for almost two solid weeks. It’s been beautiful for those of us fortunate enough to stay inside, but bless those people who had to go out and face the elements every day. So, while we await the arrival of spring, we also are gearing up to present another year of the Cowan Creek Mountain Music School. Whether you are considering coming to Cowan for the first year, or whether this makes your (14th) year, we are looking forward to seeing you again or meeting you for the first time. We think each year that it will be the best school we have ever had, and that’s our attitude again this year. As we do our planning, we are thinking, what can we do to top last year’s offerings? Well, this year we will be bringing back many of our regular faculty plus some newcomers. One of those newcomers is Robert (Bob) Martin who will be doing “Story-Telling”. Cowan Community Center is leading an effort in Letcher County to establish a Community Theater, and story-telling is going to be a major part of the performances we hope to offer. Story-telling classes will also be one of the offerings we will be having during the entire week of our music school. You will learn more about Bob and the other newcomers in the brochure that will be available within the coming weeks. In 2014, Bob directed a production for the Cowan Community Center entitled the “Homecoming” which we hope to revise and present one evening during the week of this year’s music school. We think this will add a new element of interest to the week, which we think has always held some very special moments. Remember our great opera performance last summer? Our Artisitic Director, Anna Roberts- Gevault is working to find the most talented and gifted artists possible to serve as the Visiting Masters, faculty members, and special guests for the week. Our CCMMS Program Coordinator is busy getting ready to assist you with your registrations, getting the brochures ready to go out, and making sure that all the necessary ground work is done to make this week run smoothly. So, we hope you are having a great winter where ever you are, getting some rest hopefully, making plans for your summer travels, and we certainly hope you will include a trip back to Cowan for the Annual CCMMS as part of your agenda. If you have any questions, suggestions, or comments, please feel free to leave us a message on our website, or give us a call. We would love to hear from you. Until I see you in June, stay warm, stay safe, and stay engaged in good traditional mountain music and come to Cowan and share it with us. Here we are, with a new website! Lookin’ forward to the 2013 Cowan School! Excited that Ginny Hawker & Tracy Schwarz, The Clodhoppers & Roger Cooper will be our guest master artists! On staff: Bruce Greene & Don Pedi, Carla Gover, John Harrod, John Haywood, Karly Dawn Higins & Sarah Wood, Ron Howard, Sarah Howard Montgomery, Rich Kirby, Jimmy McCown, Don Rogers, Erin Stidham, Betty Vornbrock, Amanda Wells, Jamie Wells & Jesse Wells, Randy Wilson! Registration will be up by the end of the week! The 11th annual mountain music school was a wonderful week of friends, family, music, food, and great fellowship. A total of 118 students, 30 here for the very first time. We must be doing something right!!! A great “THANK YOU” to all the faculty, staff, and community volunteers for creating another victory all in the name of old time mountain music!!! Along with “old-time” mountain music, song, and dance comes the food and fellowship of our mountain culture. Through the Grow Appalachia project, folks dined on locally grown and prepared cuisine for their Wednesday night supper. Fresh produce and fruit were provided daily during the lunch served to our wonderful participants. Young and old dined on watermelon, cantalope, peaches along with their meals. Lunch time is a great time to fellowship with friends, neighbors, especially with the talented musicians we have on staff. Old and young gather each day to partake in banjo, fiddle, guitar, singing, and string band classes either to learn for themselves or to learn how to play together. Music drifts down the hallways of the Cowan Elementary School as well as being carried along on the wind during the afternoons and early evening from the Cowan Community Center. Young children play around and about the music creating fairy houses and using whatever imagination for play. Hopefully we will see some of you next year, mark your calendars, June 24th thru June 28th, for the 12th annual Cowan Creek Mountain Music School. The 11th annual Cowan Creek Mountain Music School, June 25 – 29, 2012 will bring together some of this country’s finest old time musicians along with students of all levels, for a week of learning and fun. The school will offer courses in banjo (four levels) fiddle (four levels), beginning and lead guitar, harmony singing, old time stringband and Kids on the Creek, an arts and music class for kids ages 5 to 10 led by Erin Stidham and Amanda Wells. Faculty will include fiddlers Jamie Wells, Betty Vornbrock, Jimmy McCown, Sarah Howard Montgomery, Anna Roberts–Gevalt and new this year, Nikos Pappas and Erynn Marshall. Banjo faculty include John Haywood, Jesse Wells, Scott Prouty and Randy Wilson. Singing duo Karly Dawn Higgins and Sarah Wood will teach string band and Carla Gover will teach harmony singing. Don Rogers and Ron Howard will teach guitar. Two optional afternoon classes are available: dulcimer led by Cari Norris and square dance calling led by Julie Shepherd Powell. Students will enjoy in-class visits and afternoon performances by masters of traditional music Lee Sexton, Lewis & Donna Lamb and Jackie Helton. In the afternoon, students can join in jam sessions for all levels or a singers’ circle. Later in the afternoon there is a choice of workshops including the songs of Addie Graham led by Rich Kirby, Knott County banjo styles led by George Gibson, clogging, storytelling and more. Each evening faculty and students gather for a square dance or faculty concert. The school is held at the Cowan Elementary School and the Cowan Community Center near Whitesburg in Letcher County, Kentucky. Instrument classes are open to kids age 11 and older and adults. Tuition is $175 for Kentucky residents and $225 for out-of-state students. Registrations are due by May 31st. For a complete schedule and registration information see the website www.cowancreekmusic.org or request a brochure by e-mailing cowancreekmusic@tvscable.com or calling (606) 633-3187. Christmas used to be the time of the year I looked forward to most–that is until my family and I went to Cowan Mountain Music School 2006. Now I’m always anticipating the final week of June so I can meet up with Appalachia music mentors, teachers, and heroes; jam until daylight; meet old buddies and make new pals; dance the Virginia Reel until the fiddlers are out of steam; and learn a cool modal tuning for the banjo…oh yeah, and eat! It’s the place where I first learned how to play clawhammer banjo, and it’s a home that I come back to every year.